Once Lincoln started to think a bit more independently (and by a bit, I mean VERY independent), meal and snack time began to change. My once blissful fresh produce state morphed into countless meals dropped on the floor and one frustrated mommy. I don’t necessarily believe it is the taste of the food Lincoln doesn’t like. He will eat peas one day and turn his nose the next. My little food critic decides what he will or will not eat before putting it into his mouth. So I have had to become crafty in making healthy and wholesome food for my pint sized Anthony Bourdain. If eating can be a fun experience, it is more likely the food will be consumed! Add yogurt and sour cream to a large bowl. Stir thoroughly. Add cucumber and carrots, mix well. Add dry spices, mix well. 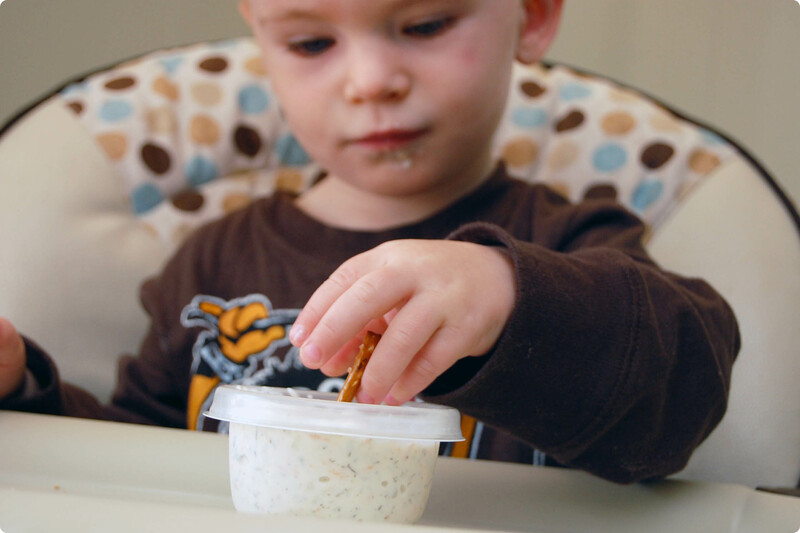 Make sure to taste before serving to make sure the spices are to you or your child’s palette. 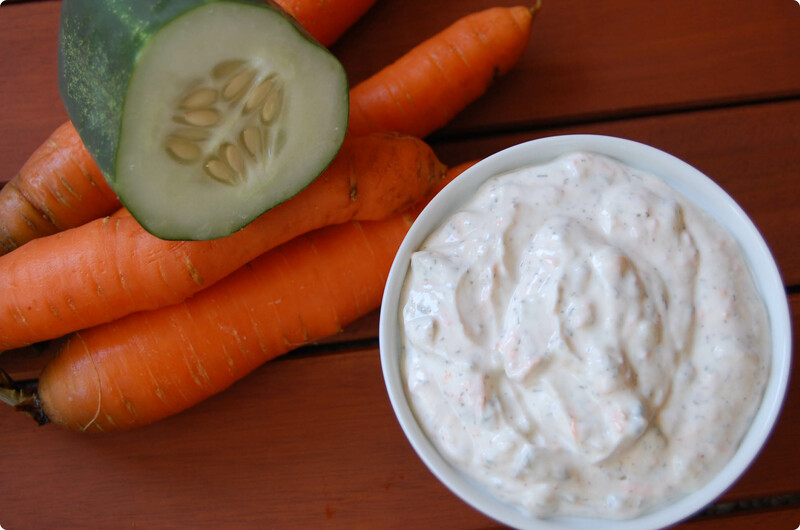 Serve with cut up fresh vegetables, crackers, pretzel sticks, pita bread or veggie chips. I like to spoon the dip into individual containers. Lincoln finds himself to be pretty awesome when he has his own bowl in which to dip. It is a great and easy snack to have on hand. If you don’t have kids, make this for yourself! It is a perfect lunchbox companion for those afternoon office munchies. What a little cutie! I love this idea. I’m a huge fan of dip in general and am always trying to find lightened up versions! I second the hummus and guacamole ideas. I have the exact same problem with my daughter. She ate everything I made as a baby but now refuses food on sight. Adding a dip or “sprinkles” (parmesan cheese) is usually enough to encourage her to try something.